"After all the scholarly books and articles about innovation and the entrepreneurial process by theorists, how refreshing it is to hear from a real live inventor holding hundreds of patents in fields as diverse as aeronautics, sailing, chess, and skiing! He has even invented a word, 'inventorship', to describe the process and guide us through dozens of examples. A very useful book. "-John Diebold, Chairman, The JD Consulting Group, Inc.
LEONARD M. GREENE, a member of the National Inventors Hall of Fame, has patented more than 100 inventions, including the stall-prevention device now essential safety equipment on all aircraft, which is credited with saving thousands of lives. His company, which for half a century has done substantial business with Boeing, recently recognized that relationship by assigning to them the patent rights on a new type of supersonic plane that is 50 percent faster than the Concord-and flies without creating a sonic boom. 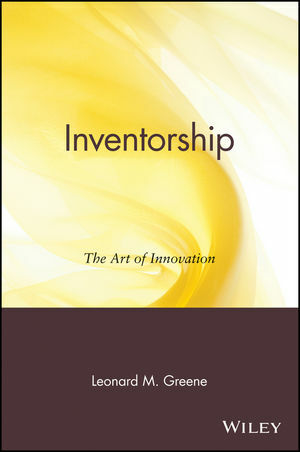 Introduction: Inventorship: The Art of Innovation. The Source of Inventive Solutions. Commitment: The Key to Successful Inventorship.